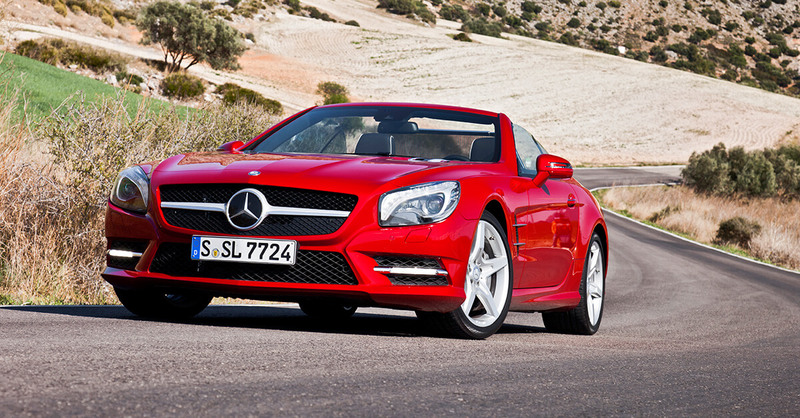 Depending on which Mercedes Benz model you drive, whether a convertible Mercedes Benz SL, SLK, CLK or E class, there are between 5-12 hydraulic cylinders that operate your convertible top. As with any auto part, these hydraulic cylinders can wear out, leak and deteriorate over time. Temperature and frequency of use play a role in how quickly the parts wear out. Heat accelerates the process, and typically the cylinders above the windshield are the first to go as these often get the hottest. The cylinders in the rear tend to operate at the same temperature consistently, so if one rear cylinder is leaking, the others are also likely to be in poor shape as well – even if they haven’t begun leaking yet. Frequency of use is also a contributing factor to failed hydraulic cylinders. It could be argued the infrequent use is actually more damaging than overuse because the cylinder shaft is lubricated less frequently, causing the seal to dry out and become cracked. However, flushing your hydraulic fluid every 3-5 years with Mercedes Benz approved hydraulic fluid is the single most important thing you can do to extend the life of your hydraulic cylinders. If repairs are needed, it is recommended that you repair at least two paired cylinders at a time, if not addressing all cylinders at once. Once the main seal in one of the hydraulic cylinders has failed on one side, a failure on the other side is generally quick to follow. Furthermore, with a perfect seal on only one side (assuming you only repaired or replaced one cylinder and not a pair) that repaired side will build up a little more pressure putting stress on the opposite side thus causing it to fail soon as well. While this might be a project for a DIY Mercedes Benz owner, it is a risky one to tackle. The seals are incredibly susceptible to scratches and damage if not handled properly, and even the slightest scratch on the soft seal material can lead to a leak down the road – quickly diminishing any savings you may have achieved by attempting the job yourself. Proper handling and installation is crucial for a successful, long-lasting repair, and it is a job best left to a certified professional mechanic. But that doesn’t mean you need to take your car to the dealership – you can trust Star Value Automotive, Sarasota and Bradenton’s premier independent Mercedes Benz repair shop, to save you time and money, while delivering expert service and guaranteed customer satisfaction. If you were to bring your Mercedes to the local Mercedes Benz dealership for the hydraulic cylinder repair, your OEM part would come with only a standard 12-month warranty. As a Mercedes Benz Master certified technician, and owner of Star Value Automotive, I am able to offer Sarasota and Bradenton clients certified affordable Mercedes Benz repairs and a 3-Year warranty on your Hydraulic Cylinders needed to repair your convertible top, and get you back to enjoying the Florida sunshine in no time at all. Hydraulic cylinder repairs are offered on Mercedes R129, R170, R171, R230, W124, W208, and W209.Not all hydraulic cylinders can be repaired. Replacement may be necessary.